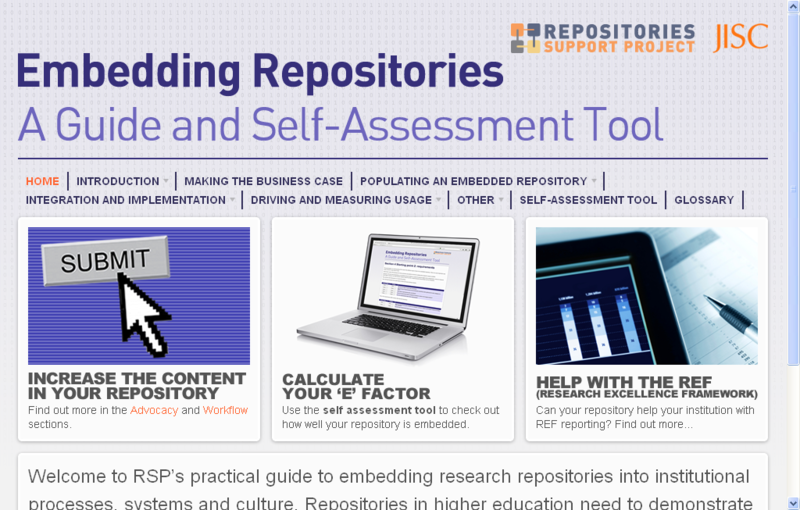 Over the past few years, there have been a number of JISC funded projects and other institutional initiatives which have focused on the embedding of research repositories into organisational systems, policies and workflows. The results have been documented in websites, blogs, conference presentations etc but they have not been synthesised into a coherent whole. The aim of this publication is to do just that i.e. collate the learning and experience of previous projects into a clear, well organised guide that is of practical help to repository staff in the UK. The guide is multi-media including textual content, video clips and a self assessment questionnaire will provide an “embedded score”. This latter will help a repository manager to focus on areas for development and also provide a useful vehicle for initiating inter departmental working within the institution. Scenario 2: embedding a repository within a research eco-system which includes a Current Research Information System (CRIS) or other research management system. Case Studies illustrate each of these scenarios and give a detailed insight as to how they have been implemented. A comments facility is included throughout the Guide and we welcome your feedback and examples of embedding at your institution. If repositories are to develop and thrive, they need to be connected to other university systems. Otherwise they run the risk of becoming silos which are peripheral to the university’s business. This guide will help in pointing the way to successful integration.